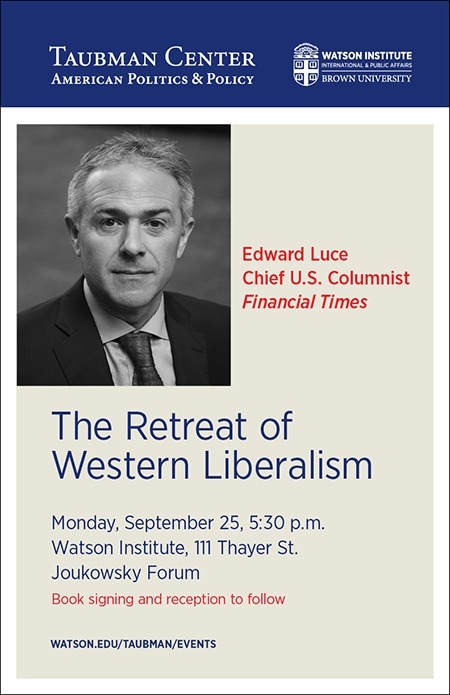 Join Financial Times chief U.S. columnist and commentator Edward Luce for a discussion of his latest book, The Retreat of Western Liberalism. The discussion will be moderated by Mark Blyth, Eastman Professor of Political Economy and Professor of Political Science and International and Public Affairs. In his widely acclaimed book Time to Start Thinking, Edward Luce charted the course of American economic and geopolitical decline, proving to be a prescient voice on our current social and political turmoil. In The Retreat of Western Liberalism, Luce makes a larger statement about the weakening of western hegemony and the crisis of democratic liberalism—of which Donald Trump and his European counterparts are not the cause, but a symptom. Luce argues that we are on a menacing trajectory brought about by ignorance of what it took to build the West, arrogance toward society’s economic losers, and complacency about our system’s durability—attitudes that have been emerging since the fall of the Berlin Wall, treated by the West as an absolute triumph over the East. We cannot move forward without a clear diagnosis of what has gone wrong. Unless the West can rekindle an economy that produces gains for the majority of its people, its political liberties may be doomed. Combining on-the-ground reporting with intelligent synthesis of the literature and economic analysis, Luce offers a detailed projection of the consequences of the Trump administration and a forward-thinking analysis of what those who believe in enlightenment values must do to defend them from the multiple onslaughts they face in the coming years. Co-sponsored by the Taubman Center and the Watson Institute.